Topher Payne's concept for a play about another chapter in the history of the homosexual experience in America is most intriguing. Per the title, a he-he and she-she pair of lovers have concocted a way to live together without risking their careers in the multi-phobic world of 1950. The State department where Bob (Robert Eili) and Norma (Julia Coffey) both work is a particularly volatile place, with any departures from the prevalent moral codes seen as red flags for people likely to be security risks in the fight against communism. Fortunately, people like playwright Payne are too young to have experienced those dark old days when the word gay was an oxymoron. But Perfect Arrangement reflects Payne's commitment to recording the long struggle experienced by homosexuals — not just in America but elsewhere. To exemplify the latter, there's Alan Turing, whose brilliance just about helped the allies to win World War II, was jailed for deviance and forced to undergo treatments purported to make him "normal." Perfect Arrangement isn't the first play about one of the sadder aspects of gay history. But it's the first that I can recall that uses the genre of farce. It's set in 1950 when new colors were being added to the Red Scare. The twist: Department of State employees Bob Martindale (Robert Eli) and his secretary Norma (Julia Coffey) are gay. And so they married each other's partners but shared beds with their lovers — Norma is married to school teacher Jim Baxter (Christopher J. Hanke) and Kitty (Mikaela Feely-Lehmann) Norma's true love, is Mrs. Bob Martindale. This farcical setup, dreamed up by Bob, taps into the sitcom-ish style in which American as apple pie married couples were presented in commercials and shows like I Love Lucy. I'm not into spoiler territory here, as the "arrangement" is revealed right after the opening scene. Given the over the top dialogue and manners on display there, it's easy to see that something isn't quite right from the get-go. Neither is it a surprise that despite Bob's being a practical, get-things-done guy, this arrangement turns out to be less than perfect. The inevitable complications begin with Bob being a well thought of favorite of his boss Theodore Sunderson (Kevin O'Rourke); so much so, that the the Martindales, Baxters and Sundersons are friendly even away from the office. The ditzy Kitty Sunderson (Jennifer VanDyck) has taken stay-at-home mock wife Millie under her wing and Boss Sunderson has tagged Bob and Julia to take on the task of identifying and firing "deviants" (Thousands of gay employees were indeed fired during this red and pink scare period). So far, so good. A campy comedy with the in the closet aspect staged as a nice visual metaphor; yet a play with serious underpinnings. The problem is that Payne hasn't quite managed to make the funny and serious elements coexist comfortably. As the play progresses there's an increasing sense that he's still deciding what kind of play he wants to write. The emphasis on farce strikes me as the more original and clever approach. This is well supported by Neil Patel's set which provides the traditional farce's four door. However when Perfect Arrangement strays into more and more into serious territory it becomes rather unbalanced. In fact, it ends up on the preachy side. The actors are all just fine and it's nice to see a new play not relying on big box office names. However, they seem more comfortable playing it straight, than sticking with the funny take on the sixties that's hilariously supported by Jennifer Caprio's costumes. Jennifer Van Dyck is the most consistent farceur. Kelly McAndrew's Barbara Grant also stands out as a believable and interesting provocateur. Robert Eli's Bob is the most complex character, but one that would have benefited from more development. 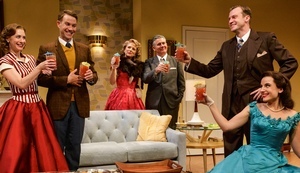 This is Primary Stages' last show at the Duke on 42nd Street before moving to the Cherry Lane. I'll miss this bright and comfortable stage with its perfect sight lines but look forward to following the company in its new home. Tuesday -Thursday at 7PM; Friday at 8PM; Saturday at 2 and 8PM; Sun 3PM. There is an added 2pm performance on Wednesday, October 28. No performances on October 21 and 31.